CLIENT – Happy Day Ice Cream, Inc. Happy Day Ice Cream, Inc. is a family owned company that has manufactured ice cream treats for close to 100 years. One of the proud traditions Happy Day holds is that it manufactures the treats from start to finish using its secret manufacturing process developed by the founders of the company. This manufacturing takes place in its own manufacturing facility built from the ground up by the company. With revenues near $10 million and a cast of loyal employees, Happy Day is a solid privately held company. Because they are a successful, hardworking, and profitable company, they pay their fair share to Uncle Sam. As such they often ask the question, “How can we minimize our tax costs?” That was when we introduced the idea of Cost Segregation to them. Because Happy Day owned their building and were paying a lot of tax, they were a prime candidate for Cost Segregation. Even though they purchased their existing facility three years prior, we were still able to accelerate their depreciation on that building by partnering with Winchester Bay to perform the Cost Segregation Study. 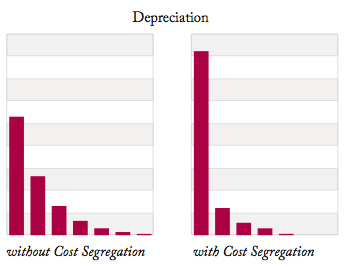 As a matter of fact, we were able to retroactively calculate the amount of depreciation they had missed over the past three years by not applying Cost Segregation and take a deduction in the current year for the amount of the understatement. In that year, we got them a deduction of approximately $300,000 in catch up depreciation and saved them around $100,000 in tax. Yes, they wrote a check for $100,000 less than they would have without Cost Segregation.